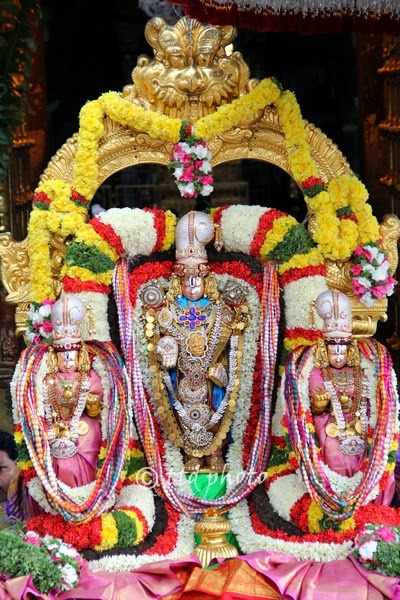 Tirumala Tirupati Devasthanams TTD celebrates Srivari Pavithrotsavam Festival on the days of Ekadasi, Dwadasi and Trayodasi in the month of Sravana(July/August) in every year. This festival is also known as Purification Festival. 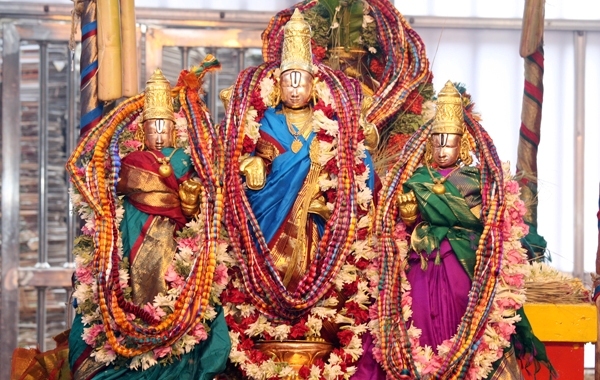 During these three days Thirumanjanam and Homam will be performed to the Main deity and as well as primary idols of Lord Sri Venkateswar Swamy. 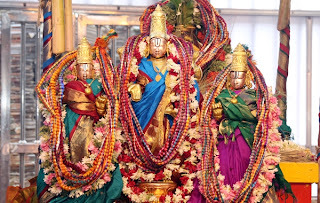 This year 2015, TTD performs Pavithrotsavam to the Lord Sri Venkateswara Swamy along with his consorts Goddess Sridevi and Bhudevi in Tirumala Temple from August 25, 2015 (Tuesday) to August 27, 2015(Thursday) with Ankurarpanam on August 24, 2015(Monday). Ankurarpanam means beginning of the festival. Sowing of nine type of holy seeds in earthen container is undertaken on the ankurarpanam day preceding the festival. This sowing ritual signifies the beginning of the festival. According to the stone inscription found on the northern wall of the Vagapadi verandah in the first “Prakaara” of the Tirumala temple, the origin of Pavithrotsavam in Tirumala dates back to 1463 A.D. The festival appears to have been celebrated till 1562 A.D. but suddenly after 1562, the festival was not celebrated might be due to the various political changes at that time. This utsavam was revived again only about 38 years ago in the year 1962. Since 1962 the Pavitrotsavam Festival has been celebrating in Tirumala Temple for three days in the month of Sravanam(July/August). On the day of Ankurarpanam, the processional deity of Lord Senadhipathi is taken out in procession to the Vasantha Mandapam. On the first day Homam (Prayer to Sacrificial Fire) will be performed at Yagasala situated inside the temple followed by Snapana Thirumanjanam(celestial bath) for about two hours to the processional deities with sandal,turmeric,milk,curd and honey. Later the temple priests conducts Pavitra Pratistha.In the evening the processional deities take a pleasure ride around four temple streets blessing pilgrims who converge to witness the grandeur of Lord Malayappa Swamy draped in dazzling Gold and Diamond jewels. On the second day after Snapana Thirumanjanam(celestial bath) special puja will be performed to the silk woven holy threads called as PAVITHRALU(Holyness) which are in Black,Blue,Red,Yellow and Green colours. These holy silk threads will be adorned to various deities inside the temple as well as deities of sub-temples located inside the temples and also to Lord Sri VarhaSwamy located adjacent to Swami Pushkarini. [The holy silk threads will be woven out of the special variety of high quality cotton which is grown exclusively in the land that is meant to grow Tulasi plant which is considered to be sacred]. Holy Homam will be performed followed by Snapan Tirumanjanam between 9am and 11am. There will be Visesha Samarpana between 1pm and 4pm followed by procession of deities in four mada streets. The festival will be concluded with Purnahuti(means The offering of Completeness) which takes place inside the temple in Pavithra Mandapam between 7pm and 9pm. Note: During this three day festival, TTD cancels all arjitha sevas and will be performed alone. Pilgrims may kindly note the changes.